NOTE: This content is old - Published: Tuesday, Jul 17th, 2018. Flintshire Council looks set to plough ahead with plans to reduce the number of subsidised bus services it provides. Under the proposals only nine of the county’s main routes will continue to be funded, with others in rural areas set to be replaced by minibuses which might not run as frequently. Meanwhile, support for some commercial bus services will be withdrawn completely. The plans received the backing of a majority of councillors at a meeting of the authority’s environment scrutiny committee today (Thursday 12 July) as it looks to create a ‘sustainable and effective’ transport network. More than 55 bus routes are currently operated by private companies across Flintshire , which either run them commercially or are either paid for entirely or partly by the council. About 40 per cent of services are subsidised by the taxpayer at a cost of £1,068,352 per year, including Welsh Government grant funding. In a report, chief officer for transport Stephen Jones said: “The council will not be able to fund the full range of existing public transport routes and meet the demand for additional routes, particularly as commercial operators reduce their services. 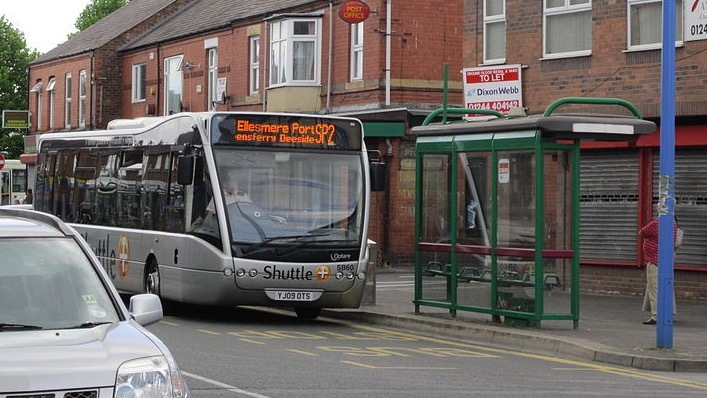 “This is because many of the supported bus services in Flintshire are still under-utilised and therefore heavily subsidised which makes them unsustainable. “The core bus network operates along strategic transport corridors across the county, linking main hubs with direct and high quality bus services. “Local travel arrangements on the non-core network are intended to be provided by smaller minibus vehicles, which are better suited to the nature of the routes in rural areas or to those where access for larger buses is restricted, such as residential housing estates. “The local travel arrangements would operate in a similar way to conventional bus services with a scheduled timetable and fixed route, transporting individuals to the local area hub or hubs along the core network for onward journeys. Scrutiny members also backed proposals to make changes for pupils who receive transport where it is not legally required. It comes after the council identified a number of cases where children were getting transport above its policy. It includes the removal of bus travel for pupils with special educational needs, who go to the breakfast club at Ysgol Pencoch in Flint. Children currently receiving transport will not be affected and it does not impact pupils being taken to school at the normal opening time. However, new starters would be unable to be taken to the breakfast club from September 2018 if backing is received from the authority’s cabinet. Cabinet members will meet today to discuss all of the recommendations in full.